Dispensa's Kiddie Kingdom & Castle of Toys was a combination toy store and kiddie amusement park. It was located at Routes 83 and 38 (Roosevelt Road) in Oakbrook Terrace. 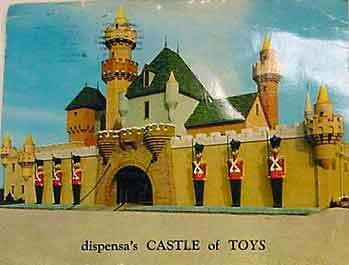 The Dispensa family, who owned the park, operated a portable carnival business in the Chicago suburbs before settling down to open the toy store (Dispensa's Castle of Toys) in 1967. The kiddie park (Kiddie Kingdom) followed in 1975. The Castle of Toys was a toy store disguised as an 8-story Bavarian castle, complete with bright colors and storybook turrets. The Kiddie Kingdom was a small-scale amusement park designed for children under 12 years old. "Kiddie parks" were a new innovation during the baby-boom years of the 1950's, and remained popular into the 1970's. The Kiddie Kingdom had, among other things, an antique German carousel and a miniature train that circled the 5-acre grounds. The park was in operation until 1984. At that time, the property was sold and the rides and attractions were auctioned off. The property was developed and is now the home of the Oakbrook Terrace Tower. The only thing remaining from the Dispensa empire is a street leading to the Oakbrook Terrace Tower, which the developers named "Castle Drive."